In her late 30s, a woman will begin waking at night with visions of riding an open-skulled cyclops head. This otherwise adorable photo, uncovered in her parents' attic, will unlock the mystery shortly after her marriage goes to ruin. 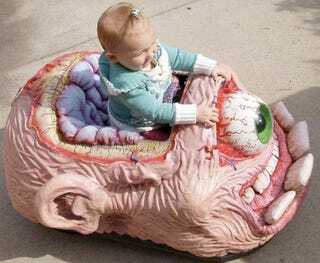 A toddler, the epitome of innocence, rides around in a wrinkly, one-veiny-eyed monster head. She sits in his exposed brain because, hey, it's a plush cushion and daddy put her there. But more striking than the juxtaposition of the car's gore and the girl's tabula rasa is the mass amount of love put into the vehicle's detailing and construction. Its fabrication is pro-level (an observation we make based upon our admittedly limited experience with lobotomized cyclopsmobiles) proving that this girl is loved, even if it takes bipedcranial locomotion for her parents to express it. UPDATE: Michael McWhertor from Kotaku pointed us the way to the source. You can find the photo (and many more) in Elmer Preslee's Flickr stream.